Here, courtesy of the organization sponsoring the design competition for a monument to commemorate the First World War, are links to some if not all of the classical entries. These are considered “the best” from among a couple of dozen submissions in traditional styles. The competition jury will be meeting in the next few days and will consider public comments submitted by readers of this blog. Please comment, but you must go to the competition web site to do so. It is here. Hats off to the National Civic Art Society and its president, Justin Shubow, for compiling this set of classical entries. You cannot comment directly from each entry, but must visit the website, which makes all entries, classical and modernist, available for viewing. 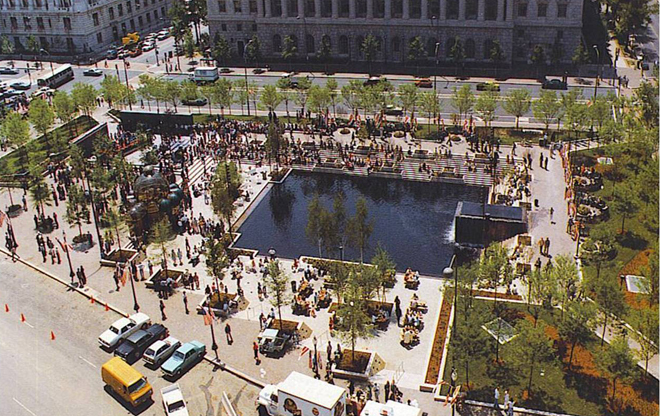 This entry was posted in Architecture, Art and design, Landscape Architecture, Urbanism and planning and tagged Classical Entries, Gen. John Pershing, Pershing Square Park, World War I Memorial. Bookmark the permalink. here is the link to the 354 submissions not on David’s Top Ten List. Just highlight and drag to your address bar. In accordance with the competition rules, not one of David’s Top Ten list are likely to be selected. Why? The cost of an average house in D.C. is $500,000 sans granite block and 100 foot columns. Finally, as a billionaire critic of another D.C. monument once said, non of these “speak to me”. Just to be clear on your argument, you’re claiming “in accordance with the competition rules” none on his list will be selected because the cost of cheap building materials are expensive enough? The problem is cheap materials don’t last, so the true cost over time is greater. I am saying that the costs of materials and construction of David’s Top Ten List exceed the threshold set by the competition’s rules by several orders of magnitude. The remedy is to either simplify the design or be prepared to raise considerably more then is anticipated. that said, I’ve looked at David’s Top Ten and asked a simple question – A decade from now, what would a youngster who never heard of WWI carry away after visiting them? Well they’re big, they look old, they’ve got nice ramps for skate boarding, but not much about bravery vis a vis WW1’s horrors. Certainly not poorly outfitted doughboys, Sgt. York/ CPL Buckles, the mustard gas, trench warfare, pilots without parachutes, wholesale slaughter of war horses and dogs. Architectural style should serve the reason, not be the reason, for the memorial. But that’s just me. I don’t understand how those on David’s list exceed the threshold by several orders of magnitude…the upfront cost of masonry buildings (assuming your quibble is with brick and stone) is generally only slightly (i.e. a few percentage points) greater, including labor. And because it is inherently durable and won’t need to be replaced in 40 years, one can assume a life cost of half as much of what I believe you to be in favor (by contrasting this list we discuss with the majority of the submissions) within one or two generations. Unless you have some data to backup your assumption I think it’s simply a (sadly common) misunderstanding that engineered materials with ingredients from all over the world are cheaper than digging up a stone nearby. So let’s assume your first argument of cost was just a mistake, and now we’re moving on to your new point which is a question of Character and Style. The character of a monument or memorial is typically one which uplifts; a youngster can learn about bravery through more than just the horrific aspects of WWI. One doesn’t have to be devastated to be a student learning math or science or history in a classroom, and encouragement of the values worth fighting for doesn’t always come with a whip. I would argue that the point of these memorial entries are to commit to memory that which they serve (i.e. the “reason); and your pejorative comment implying they are merely self-serving monuments to scream “look at me and forget about WWI” is unnecessary. Actually, I had that link in both of today’s posts about the WWI competition. Your quote from the rules does not preclude most of these classical entries, certainly not all of them. I would add still more to the list of classical entries. There are entries with columns and entablatures and tectonic expression that apparently don’t meet either of your criteria of “classical.” Just define your premise if you make an ultimatum of “all the best” or “all the classical” because it seems clear that you’ve skipped quite a few. Which is it? All of the classical entries as the first sentence in the quote states, or a couple of dozen? Or do you mean to say the classical ones are the best of the traditional styles. Even so, as Christopher points out, there are several classical entries not listed. I’d just clarify to say it’s “my personal favorites” instead of “these are considered the best” because the implied authority is not grounded in any sort of context or explanation. Sorry for the diatribe, I just don’t favor “Top 10 lists” all across the internet when you do others a disservice by–whether as a mistake or not–glossing over them. We’re in this together, not trying to start a faction. You and Christopher are correct, and I apologize for my truncated list. My explanation is not justification, certainly, but I was trying to get it out as quickly as I could and I accepted the judgment of others as to the “best” classical submissions. As it turns out, one must go to the competition website anyway in order to comment, and there does not seem to be an easy way to do that – not that I could find – let alone a quick way to identify the classical entries, be they good or not so good. Sorry! With all due respect, you should probably define your definition of “best” as you and just a few others on TradArch narrowed Christine’s. I disagree that your list encompasses all the classical examples. It certainly seems to grasp half of the traditional/classical entries, but not all. Your objection has merit. See above.